St. Andrews Church Parish House, 3105 Main St., Buffalo. The concrete blocks have been painted. St. Andrews Church Parish House, 3105 Main St., Buffalo. St. Andrews Church Parish House. The concrete blocks have been painted. A standard for foundations and later as a substructure under brick or other forms of cladding, concrete block is one of the most ubiquitous 20th-century building materials. An early form was the handmade picturesque rusticated concrete block. So called because the exposed surface resembled textured stone, rock-face block first appeared late in the 19th century when innovations in cement making made it possible to press concrete blocks on work sites. When an inventor named Harmon S. Palmer created a machine that added textured or architectural faces to the blocks as they were pressed, rock-face block became a national phenomenon. The blocks were a staple of Sears kit homes, appearing from the foundations to the roof line. Many of these early concrete installations suffer from deterioration, especially steps, porch walls, and other exposed areas. Luckily there are several sources for modern rusticated block. Ornamental cast concrete blocks were popular from about 1890 until 1940, used most often for foundations but also for porch and whole-house construction. They were available at building supply houses, but also could be made on-site using block machines sold by Sears, Montgomery Ward, and other building suppliers. 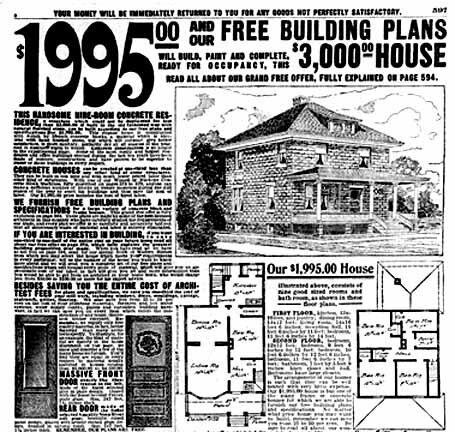 The 1910 Sears Building Catalog sold molds not only for blocks, but also for fluted columns, column bases and capitals, piers, water tables, and nearly any detail needed to assemble a house. Removable plates allowed the machine to cast a variety of face designs, including rock face, ashlar, cobblestone, bush-hammered, or decoratively scrolled. - A Field Guide to American Houses," by Virginia & Lee McAlester. New York: Knopf, 2000, p. 444.